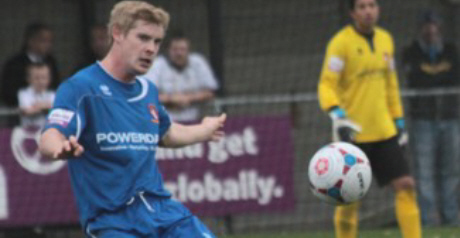 Hayes & Yeading defender Charlie Wassmer has left the club and signed a two-year deal at Margate. The 22-year-old was a non-contract player at United and on Thursday accepted an offer from the ambitious Ryman Premier Division club, managed by former Hayes boss Terry Brown. Wassmer’s 49th and final appearance in a United shirt ended in controversy against Bath on Tuesday night when he argued with goalkeeper Jamie Young after a communication breakdown led to the second goal in a 2-0 defeat. However, United manager Phil Babb insisted the centre-back’s departure was unrelated to that incident, which has been dealt with internally by the club. Babb told West London Sport: “We played Margate in a behind-closed-doors game last Saturday [after the league game with Tonbridge was postponed]. “He clearly impressed Terry and they have come in with a seven-day approach for Charlie, which we agreed to waiver and allowed him to speak to them. He has since signed a two-year contract. It is the second time Hammersmith-born Wassmer has been lured away from the club. He emerged through the United youth ranks and impressed so much in his initial first-team appearances that he was bought by then-Conference leaders Crawley Town for an undisclosed fee. However he made only 13 appearances for the Sussex club, with loan spells at Fleetwood and Dagenham, before leaving Crawley in December 2012. Wassmer ended the 2012-13 season at Cambridge United but rejoined Hayes and Yeading last summer, earning himself a regular place in the defence alongside Dean Inman. United are hoping to bring in a centre-back on-loan from a higher-level club to replace Wassmer and are also in advanced talks to re-sign midfielder Matty Herriott on-loan from Northampton.